At first glance, agenda item 12 appeared to be a mere formality for Pahrump Town Board members to discuss and approve during Tuesday evening’s regular meeting. It wasn’t. The item sought board approval for a rental agreement with WaveDirect to use space on the Pahrump cell tower. The company provides rural broadband internet service. During a previous meeting last month, board members approved leasing space to Wecom, another communications company on the town’s cell tower. The agreement opened up a revenue stream ranging from $1,100 or $1,200 a month. The WaveDirect agreement, according to board member Dr. Tom Waters, will also generate additional revenues for the town. “It is $750 per month for the five-year contract.” He said. That is $9,000 a year or $45,000 for the entire five years. The tower is there so this is all positive news for the Town of Pahrump,” he said. In an effort to expedite the agreement, Town Manager Susan Holecheck openly acknowledged the contract contained a few typos that could be remedied in short order upon approval by the board. Town Board Vice Chair Bill Dolan, however, took issue with the innocuous errors, including a reference to the location and owner of the tower – Panorama Road Tower Landlord. “Your rationale for the PRTL, I would like to see that referred to as ‘the town.’ That’s how all of our contracts are and I think that’s how it should be referred to,” he said. Dolan also pointed to missing attachments in the agreement, which prompted Holecheck to inform the board that in the haste of completing the contract, there were some errors that were discovered and will be addressed prior to executing the agreement. “This was done to try to get your approval as quickly as possible,” she told Dolan. “You’re making the same comments that I have made already and I will make sure that we go through this with a fine-tooth comb,” she said. Additionally, Dolan did not like the fact that the town manager will sign off on the agreement rather than a member of the town board. He told the room that no town manager has ever signed-off on town contracts – ever. “As far as executing this contract, we have never had a town manager execute a contract that I’m aware of. It’s always been the chairman and I think it should be the chairman now,” he said. 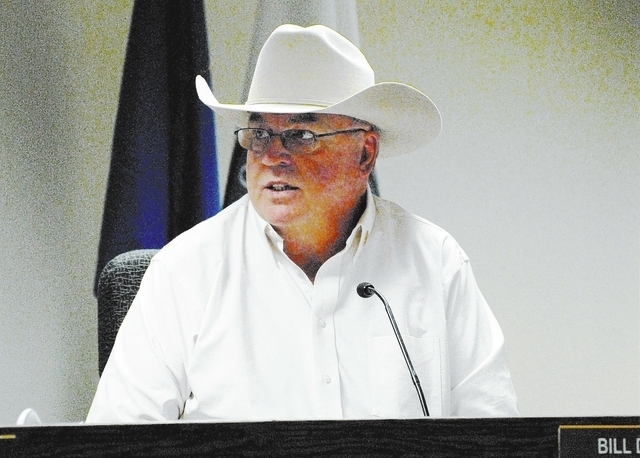 Holecheck, who has served many years as a public administrator and former Mayor of Mesquite, was quick to inform the vice chair that it is indeed common practice for a town manager to sign off on town related contracts. She supported her reply with prior evidence of former Pahrump Town Manager Bill Kohbarger’s history of signing town contracts. “Your town manager has executed every single agreement and I can show you all of the agreements with Mr. Kohbarger and that is exactly who executed your agreements. All of the agreements have always been executed by me after town board approval,” she informed the board. She also said any such concerns among board members would better be addressed in the days before regular board meetings for the sake of expediency and professionalism during public meetings. “If any of the board members have questions or concerns about items like this, I would really appreciate if they contact me before the board meetings. Not that we ever want to keep anything from people, we do want that transparency and we want to look like we’re a cohesive, efficient and effective body. If there is something in the agreement that they don’t like, I’d like them to tell me because I work with our legal counsel,” she said. Waters supported the town manager’s position on contracts. “I just want to say the contracts that I’ve seen for the town, have always been the town manager, but I have also seen an additional signature with the chairman, but I have always seen the town manager’s,” he said. Following further discussion, board members directed staff to make the necessary amendments to the agreement and eventually approved the item.